Each one of listed mandates, that work somewhat in tandem with one another, offers a possible answer to the question. Is the Lab dedicated to efficiencies and user-experiences of public service delivery, in which case, which sectors should it seek to align itself to? Where does the need lie? Is the Lab set out to increase the number of citizen participants in public decision making processes or public service delivery? What platforms and technologies does it seek to achieve this through? Is the Lab dedicated to building expertise in the domain of urban informatics, becoming in nature a sectorally agnostic Lab? Is it seeking to identify and incubate the next thirty public innovation start-ups, turning each one of them into a Lab unto itself? Having spent a significant part of the year building an argument for a Civic Innovation Lab as it has been defined above, we now need to identify which aspects of the Lab remain sacrosanct and core to its future? What elements are movable? Perhaps there is a need to define the Lab using Zaid Hassanâ€™s typology of Labs as either Technical, Social or Socio-technical. 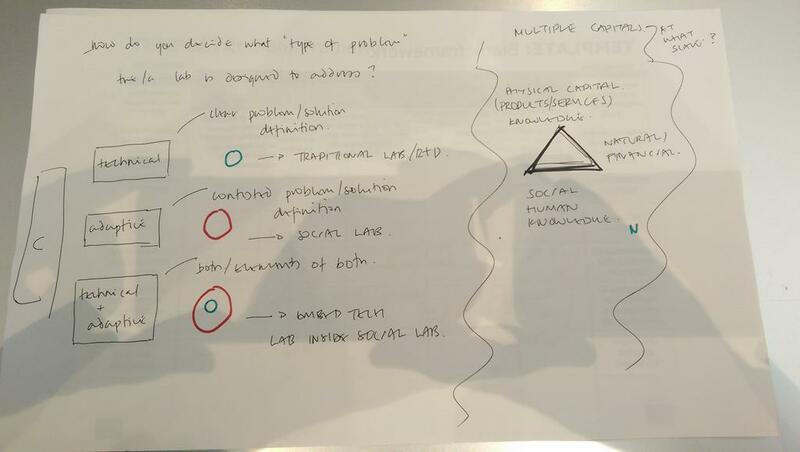 Our visions lean towards a socio-technical model, but what are the technical competencies the Lab offers, and what are the social dimensions of the problems that the Lab seeks to solve? Or could we perhaps use a more traditional SWOT analysis approach to narrowing in on the essence of the Lab? It is also appearing necessary to separate out the mandate of the Lab from its approach, or differentiate between the parts of the Lab that are process, and the parts that as institutional. Earlier in the year, as we were educating ourselves on the culture and applications of open data, we were asking ourselves if there was a category of challenges, or specific sectors that lent themselves particularly well to open data based approaches of problem solving. We now need to cast our question much wider, to ask – what are the real and right problems to be solving, and what approach is best suited to address them? This entry was posted in Design Challenges, Design!publiC. Bookmark the permalink.